I haven't been posting latelly because of some technical problems, but I hope to catch up during the next couple of weeks. For today's post, some WIP pics. I read the book "Battle of the Fang" last year, and I really liked it. Every space wolves player will enjoy it, and also if you like some epic, desperate defensive battle till the last man. Well, in this book, some of the characters were part of the Kaerls, the Planetary Defense Force of Fenris. They are just normal humans, who are bred to serve the Chapter, and who reverence the Space Wolves as semi-gods. As all the natives of Fenris, they are aggressive, brutal, fearless warriors. I really liked the way they are organized and how they interact with the Space Wolves. With the coming of 6th edition, the possibility of including allies, and an article in White Dwarf 392 (August 2012) about Battle Brothers, where Phil Kelly shows his army: Imperial Guard with Space Wolves army. I have considered for some adding some imperial guard allies to my Space Wolves army, to represent the Kaerls. I left that project aside while I keep painting my Ultramarines army, but now I am going to start working on it (slowly). 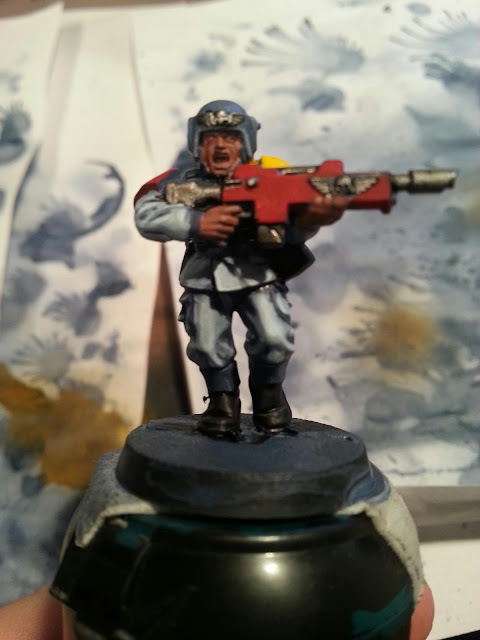 Because of that, last week I got a cheap box of 5 Cadian troops, and I started painted them. My idea is making them look as part of the Space Wolves army, and I would convert them to make them look as Fenrisians. However, I have to choose a paint scheme, so I would use this 5 Cadians as test models, till I choose a paint scheme that fits well with my Space Wolves. 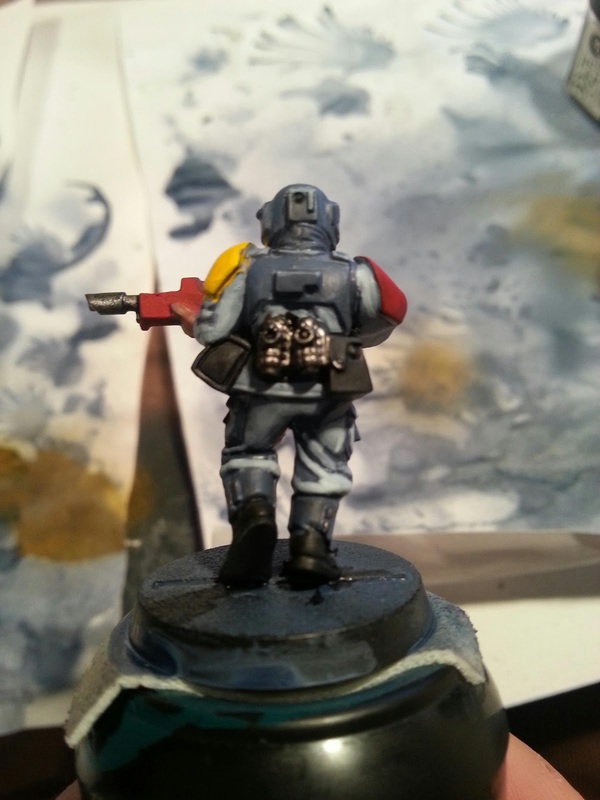 Here are some pics for the first model. I used Fenrisian grey in the clothes, and the Fang in the armour and helmet. 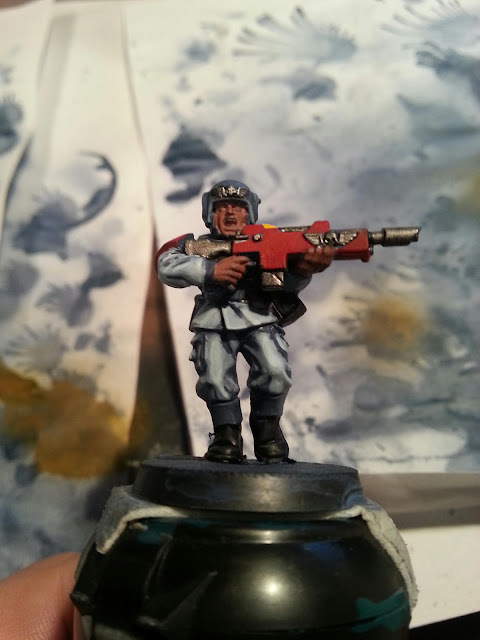 I thought the red rifle added some needed contrast to the mini.